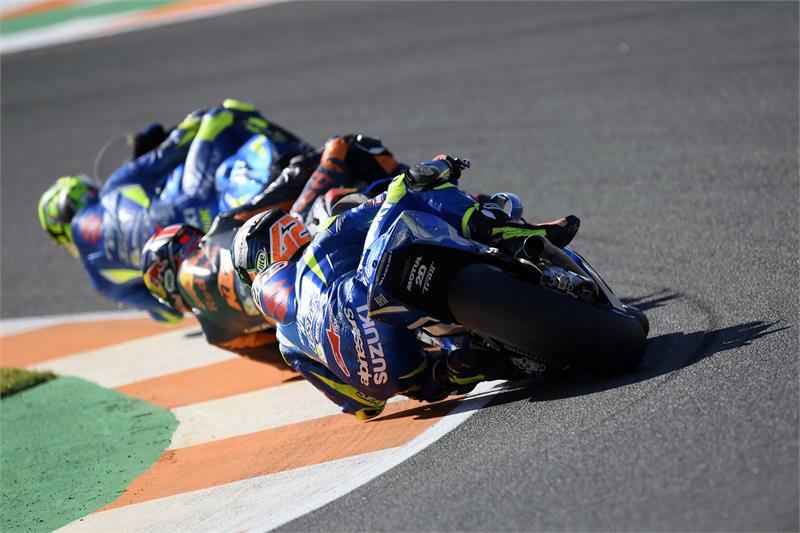 Team Suzuki Press Office – November 11. Andrea Iannone capitalized on the positive improvements made at the weekend and put together a very effective qualifying round, with one lap in 1’30.399 that gave him third place in classification and tomorrow’s grid. A consistent Alex Rins took 10th place with 1’30.972. It was a good start to the day for both Iannone and Rins, who settled their GSX-RRs in the top ten at the beginning of the session. As the times began improving lap by lap, Iannone was able to take advantage of the better feeling with the bike and clock 1’30.501 which gave him 3rd place in the session’s classification, and also third in the combined. The young Rins made even bigger improvements compared to yesterday’s performance, cutting nearly one second off his FP2 time and getting under the 1’31 wall. The 1’30.846 in today’s FP3 was 5th fastest of the session and 6th fasted in the combined. This was enough to get direct access to Q2. Not having to dispute the Q1 session, both riders could focus their afternoon on FP4 and Q2. In the early session of the afternoon, Iannone and Rins demonstrated a solid and fast pace, finalizing good setups for tomorrow. In qualifying things heated up, with many riders improving their lap times considerably. Iannone gained confidence during the battle and kept his performance alongside the top part of the class. His ability to take advantage of the new tyres in the last round paid off with the 3rd place finish, which gives him a good chance in tomorrow race. There is also a good chance for a positive GP for Alex Rins, who classified tenth in qualifying, but has a renewed enthusiasm for the direct access to Q2. He also showed his performance was both solid and consistent in terms of pace. “So far it has been a nice weekend and it is beautiful to get back in front row after a very difficult season. Since yesterday Andrea has been able to ride very fast and he continued to do so today. Finally he got in the front row, so hopefully he will be able to make a good start, keep pace with the top guys, and complete a good race. Alex is having a good weekend as well. He had a great FP3, going into Q2 directly. He is starting from 10th position, but he can have a good race. We have a good pace with both riders so we hope to finish the season in the best way, with a nice race.